Club will meet once a month on the 2nd Tuesday at 7:00pm. Club will run from February-October 2019. 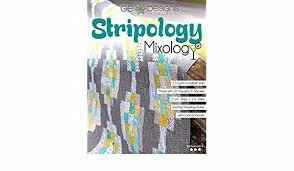 We will demonstrate 1 technique from the book Stripology Mixology. You must have the book or purchase it for the club. We will also serve snacks and a sample of a cocktail from the book. We'll have show & tell, and chances for prizes. You won't actually sew at the club meetings. You will receive 15% off the featured pre-cut each month for being a club member. One time fee to join is $10 (may join at any time- fee will NOT be prorated).